The ectonucleotidase CD39 has recently been described as being highly expressed on regulatory Foxp3+ CD4 T cells. Through hydrolysis of proinflammatory extracellular ATP, CD39 activity represents a newly described mechanism of regulatory T cell action. We report a novel population of human CD4 T cells that express CD39 yet are Foxp3 negative. These cells produce the proinflammatory cytokines IFN-γ and IL-17 and fail to suppress proliferation; however, they still have high ATP hydrolysis activity. In the inflammatory site in human juvenile idiopathic arthritis, the CD39+Foxp3− population is greatly increased compared with peripheral blood of patients or healthy controls. We also show that cells expressing the AMPase CD73 are less frequent in the joint than in blood. To our knowledge, this is the first study to describe and characterize CD39 function on CD4 T cells from the target site in a human autoinflammatory condition. Our data suggest that in human CD4+ T cells from the inflamed site, CD39 can be highly expressed on two populations, one regulatory and the other of a memory phenotype. Regulatory T cells (Tregs) have a key role in control of the immune system and in suppressing inflammatory reactions (1). There are a number of mechanisms by which Tregs suppress proliferation and cytokine production by other cells, including depletion of IL-2, direct toxicity through granzyme or perforin, or via cytokines, such as IL-10, TGFβ, or IL-35 (2). Naturally occurring Tregs are characterized as CD25hiFoxp3+CD4 T cells, and the recent identification of the ectonucleotidase CD39 (ectonucleoside triphosphate diphosphohydrolase-1) on Tregs has led to a novel proposed mechanism of Treg action (3). Borsellino et al. (4) described the presence of Foxp3+CD39+CD4+ T cells in human peripheral blood and found a reduced proportion of CD39+CD4+ T cells in the periphery of patients with the autoimmune disease multiple sclerosis. They show that levels of Foxp3 expression positively correlate with that of CD39 expression on human CD4 T cells. CD39+ Tregs have also been shown to be increased in patients with head and neck carcinoma, in whom they may contribute to immunosupression seen in cancer (5). CD39 is an ectoenzyme that is proposed to have anti-inflammatory action by hydrolyzing ATP and ADP, respectively, to AMP (6, 7). Extracellular ATP has a number of proinflammatory effects in human cells via P2X7 receptors (8, 9), including release of IL-6, IL-1β, and IL-18; cytokines that are linked with arthritis (10, 11), the autoinflammatory disease chronic infantile neurological, cutaneous, and articular syndrome/neonatal onset multisystemic inflammatory disease (12), diabetes (13), and lupus (14), among others. Recently, ATP has been demonstrated to drive differentiation of a specific subset of Th17 cells (15). Th17 cells have been implicated in autoimmune diseases including psoriasis, ankylosing spondyltitis, and, recently, juvenile arthritis (16–18). Recently, human CD39+Foxp3+ cells have been shown to be able to suppress Th17 cells, but also to be impaired in multiple sclerosis (19). The presence of CD39 or antagonists of P2X7 receptors prevents the activation and secretion of IL-1β and IL-18 (8, 20, 21). The balance between ATP and ADP or AMP, which are precursors of anti-inflammatory adenosine (22), is thought to be one target of the commonly used disease-modifying immunosuppressant drug methotrexate (23). Together, these data implicate CD39 in an anti-inflammatory role, because it may contribute to hydrolysis of ATP to ADP and AMP, reducing proinflammatory ATP in favor of increased ADP or AMP precursors of anti-inflammatory adenosine. CD39 breakdown of ATP and consequent generation of adenosine may therefore represent an important immunoregulatory mechanism. Downstream of ATP hydrolysis by CD39, human Tregs have recently been shown to generate adenosine via action of the enzyme CD73 (24). In murine T cells CD39 expression on CD4 T cells has recently been shown to mark not only Tregs, but also a memory T cell (Tmem) population (25). The role of CD39 in human immunoregulation is an area of active investigation and has not previously been explored in cells directly from the inflamed site. We therefore investigated the role of CD39 in a human inflamed site, namely the joint in juvenile idiopathic arthritis (JIA). In this study, we demonstrate the presence of high numbers of human CD39+ T cells in the inflammatory site and propose that the link between CD39 and regulatory activity might be less tightly coupled in inflammation than in healthy T cells. At the inflamed site, in this case the joint affected by autoimmune arthritis, we have observed human CD39+ CD4 T cells that are not classical Tregs, as they do not express Foxp3, and that are more abundant in the joint than in peripheral blood. CD39+Foxp3− cells have ATP-hydrolyzing capacity but do not function as classical Tregs. Our data are the first to identify and characterize human CD39+CD4+ T cells that are not classical Tregs directly from the site of inflammation in autoimmune disease. Forty-eight patients with JIA (31 females and 17 males) as defined by the International League of Associations for Rheumatology criteria were included in this study along with 25 healthy controls (20 females and 5 males). The study had full ethical approval (Local Research Ethics Committee). Peripheral blood and synovial fluid samples were obtained with informed consent of parents or subjects over 16 y old. Patients with JIA had a mean age of 9.3 ± 3.8 y at time of sampling. Peripheral blood and synovial fluid samples were collected and processed within 2 h of collection from patient. PBMCs and synovial fluid mononuclear cells (SFMCs) were isolated by density gradient centrifugation on LymphoPrep (Axis-Shield, London, U.K.) according to standard methods. Synovial fluid was obtained at the time of clinically indicated arthrocentesis and treated with 10 U/ml hyaluronidase (Sigma-Aldrich, Dorset, U.K.) for 30 min at 37°C before density gradient isolation. Anti-human mAb specific for CD3 (clone SK7), CD4 (L200), CD19 (HIB19), CD14 (M5E2), CD25 (B-Ly1), CD39 (eBioA1), CD45RO (UCHL-1), CD73 (AD2), CD127 (eBioRDR5), CCR4 (1G1), Foxp3 (PCH101), IFN-γ (4S.B3), IL-2 (MCA1553 from Serotec, Oxford, U.K.), IL-17 (eBio64DEC17), Ki67 (B56) conjugated to FITC, PE, PE-Cy5, PE-Cy7, PerCP, allophycocyanin, Pacific blue, or Qdot 605 were from BD Biosciences (San Jose, CA), eBioscience (San Diego, CA), or Invitrogen (Paisley, U.K.). A total of 2 × 105 cells were incubated in 96-well plates with Abs for 20 min on ice. Five-color flow cytometry data were collected on a Cyan ADP (Beckman Coulter, Fullerton, CA); six-color cytokine expression flow cytometry data were collected on an LSR II (BD Biosciences) and analyzed using FlowJo (Tree Star, Ashland, OR). To assess intracellular cytokines, cells were incubated at 37°C in the presence or absence of 1 μg/ml brefeldin A, 50 ng/ml PMA, and 500 ng/ml ionomycin (all from Sigma-Aldrich) for 3 h. Cells were stained for surface markers as above and then fixed and permeabilized according to the manufacturer’s instructions (eBioscience). Permeabilized cells were then stained with Abs against Foxp3, IFN-γ, IL-2, and IL-17, as indicated in the Results, for 1 h on ice and then washed twice in permeabilization buffer (eBioscience). Cells were resuspended in cold PBS containing 2% FBS, and data were acquired on a Cyan ADP (Beckman Coulter) or a BD LSR II (BD Biosciences). Cell sorting was performed on the BD FACSAria (BD Biosciences) or the MoFlo XDP (Beckman Coulter). To characterize CD39 activity, PBMCs and SFMCs were stained with anti-human CD39 and sorted into CD39+ and CD39− populations. For suppression assays, cells were stained with Abs to CD4, CD25, CD127, and CD39 and sorted into three T cell populations: CD4+CD25hiCD127loCD39+ (enriched for Tregs within the CD39+Foxp3+ population), CD4+CD25loCD127hiCD39+ (enriched for CD39+Foxp3− cells), and CD4+CD25loCD127hiCD39− (responder T cell [Tresp] enriched for CD39−Foxp3− cells). Sorted cells were analyzed for purity and Foxp3 expression by flow cytometry. CD4+CD25hiCD127loCD39+ that were highly enriched for Foxp3+ expression had a mean of 74 ± 17% Foxp3+ (for CD39+Foxp3+-enriched cells). The other sorted populations were 79 ± 11% (for CD4+CD25loCD127hiCD39+ cells) and 93 ± 5% (for Tresp) negative for Foxp3 expression, respectively. A total of 2.5 × 104 cells/well were incubated at room temperature for 10 min in the presence of 25 μM ATP (Sigma-Aldrich). CellTiter-Glo reagent from the Luminescent Cell Viability Assay (Promega, Madison, WI) was added as per manufacturer’s instructions. CellTiter-Glo contains a source of luciferase, which, in the presence of ATP, releases luminescence that was rapidly measured using an Optima luminometer (BMG Labtech, Aylesbury, U.K.). ATPase activity was measured by a reduction in luminescence (light units) during the assay. The ATPase inhibitor ARL67156 (100 μM; Sigma-Aldrich) was added in conjunction with exogenous ATP as indicated in the Results. ATPase activity was measured using an HPLC-based method (26). Etheno (E-) analogs of ATP and breakdown products (E-ATP, E-ADP, E-AMP, E-adenosine, and E-adenine) were analyzed by reverse-phase HPLC with fluorescence detection (excitation 290 nm, emission 415 nm) Substrate conversion was analyzed by peak area with reference to standards. A total of 5 × 104 cells/well were incubated at 37°C for 40 min in the presence of 25 μM E-ATP or E-AMP substrate (Biolog, Bremen, Germany) in the presence or absence of the ATPase inhibitors ARL67156 (final concentration 100 μM) or the CD73 inhibitor α,β-methylene ADP (APCP; final concentration 10 μM; Sigma-Aldrich). The reaction was stopped by acidification to pH 3.5 with HCl, centrifuged (10,000 × g for 3 min, 4°C), and supernatant frozen (−80°C) until analysis by HPLC. Bar graphs show mean percentage of substrate remaining. Sorted CD4+CD25hi CD127loCD39+ (enriched for Tregs within the Foxp3+CD39+ population), CD4+CD25loCD127hiCD39+ (enriched for Foxp3− CD39+ cells), and CD4+CD25loCD127hiCD39− (Tresp, enriched for Foxp3−CD39− cells) were stimulated with MACSiBeads conjugated with anti-CD3 and anti-CD28 Abs at a ratio of one bead/two cells, as per manufacturer’s instructions (Miltenyi Biotec, Surrey, U.K.). Cells were incubated for 7 d at 37°C in an atmosphere containing 5% CO2 in RPMI 1640 supplemented with l-glutamine (Invitrogen) and 10% FBS (RPMI 1640 10% FBS; Invitrogen). On day 7, cells were then assessed for Ki67 expression using flow cytometry. To assess suppression of proliferation, 1 × 105 sorted CD4+CD25loCD127hiCD39− cells were stimulated using Treg Suppression Inspector (Miltenyi Biotec), in which microbeads precoupled with anti-CD2, anti-CD3, and anti-CD28 were added in a 1:1 ratio with cells in a 96-well flat-bottomed plate. To assess suppressive capacity of autologous CD4+CD25hiCD127loCD39+ and CD4+CD25loCD127hiCD39+ populations, each of these cell populations was added in a 1:1 ratio to the Tresp CD4+CD25loCD127hiCD39− population. A total of 1 μCi [3H]thymidine (Amersham Biosciences, Buckinghamshire, U.K.) was added at day 6 and the cells harvested 24 h subsequently to assess proliferation using a Microbeta counter (PerkinElmer, Cambridgeshire, U.K.). To calculate percentage proliferation, data in counts per minute were expressed as a proportion of proliferation of the CD4+CD25loCD127hiCD39− Tresp population. Data were analyzed in Prism version 5 (GraphPad, San Diego, CA). Comparisons between data were made using Mann-Whitney t tests. p ≤ 0.05 was considered significant and is indicated on bar graphs in figures by a horizontal line; differences between groups are shown by a horizontal line with capped end in figures. Data are presented as mean ± SD unless otherwise indicated. CD39 has been proposed to be a marker of Tregs in both mouse and human (4, 7). Using flow cytometry, we assessed the expression of CD39 on human PBMCs from healthy controls and patients with JIA in parallel with cells from the inflamed joint (i.e., JIA SFMCs). Fig. 1A shows CD39 expression on T cells in a healthy control and in a single patient in blood and the corresponding inflamed joint. Given the wide variation in human populations, the data are summarized in Fig. 1B. We observed a striking increase (p < 0.001) in the proportion of CD39+ cells within the CD3+ T cell population at the inflammatory site compared with peripheral blood T cells (Fig. 1B; 31.5 ± 14.2% in SFMCs compared with 5.1 ± 2.1% in PBMCs from patients). To establish if this increased expression of CD39 was restricted to the CD4 T cell population (which contains classical Tregs), we measured CD39 levels on CD4 and CD8 T cells. We found significantly increased numbers of CD39+ cells in the total CD3+ population of both CD4+ and CD8+ lineages (Fig. 1A, histograms, 1B). In addition to the increased proportion of CD39+ cells within SFMCs, there was an increased CD39 protein level on CD39+ cells for SFMCs compared with PBMCs as demonstrated by the higher CD39 mean fluorescence intensity (MFI) (Fig. 1C). Notably, CD39+ synovial CD4+ T cells have a significantly higher CD39 MFI compared with CD39+ CD4 T cells from the peripheral blood of patients with JIA or healthy controls (350 ± 171 on SFMCs versus 167 ± 91 on JIA PBMCs or 117 ± 46 on healthy PBMCs; p = 0.002 and p = 0.008, respectively). T cells from the inflamed joint express higher levels of CD39 than those from peripheral blood. CD39 expression was determined by flow cytometry in PBMCs from healthy control donors and patients with JIA and also SFMCs from the inflamed joint of patients with JIA. A, Data from healthy control PBMCs and, from the same patient, JIA PBMCs and JIA SFMCs. Top panel, dot plots show expression of CD39 and CD3 in one representative experiment of >15 of each sample. Middle and bottom panels, Histograms show CD39 expression on T cells gated on CD4, CD8, respectively. B, Bar graph shows proportion of CD39+ cells within total live population and within total CD3+ T cells and CD3+CD4+ and CD3+CD8+ T cell subsets. Bars represent the mean + SD. C, CD39 MFI of CD39+ cells within each population listed in B. B and C, Each bar represents the mean + SD of data from healthy control PBMCs, JIA PBMCs, JIA SFMCs (n = 7, 10, 7, respectively); horizontal bar represents p < 0.05. Total of 2.5 × 104 each whole PBMCs or whole SFMCs (D) or mononuclear cells sorted by flow cytometry into CD39+ and CD39− populations (E) were assessed for ATPase activity with exogenous ATP added in the presence or absence of 100 μM ATPase inhibitor ARL67156 (ARL). ATP remaining at the end of the incubation was measured in light units. ATPase activity reduces ATP. Quantity of ATP is directly correlated with light units. Bar graphs represent the mean + SD of healthy control PBMCs, JIA PBMCs, and JIA SFMCs (D, n = 4, 8, 6, respectively; E, n = 4, 6, 3, respectively). F–H, E-ATP breakdown products were measured by HPLC. A total of 5 × 104 cells were incubated with 25 μM E-ATP for 40 min at 37°C in the presence or absence of 100 μM ARL. F, Representative HPLC chromatograms showing E-ATP breakdown by healthy PBMCs sorted into CD39+ and CD39− populations (left and right panels, respectively) ± ARL (top and bottom panels, respectively). Each bar represents the mean + SD of data from healthy control PBMCs, JIA PBMCs, and JIA SFMCs (n = 3, 4, 4, respectively) unsorted (G) or sorted into CD39+ or CD39− cells (H). We then investigated whether this observation, that the cells from the inflamed joint had an increased proportion of cells expressing CD39 and higher CD39 MFI, has a functional correlate. Due to the proinflammatory effects of ATP (9, 27, 28), the ATPase activity of CD39 is proposed to be a mechanism by which regulatory effects may be exerted by Tregs (3, 4, 7). Upon addition of exogenous ATP, unsorted SFMCs were demonstrated to have a significantly higher ATPase activity compared with peripheral blood as assessed by luminometry to measure remaining ATP (1546 ± 143 for SFMCs, 2490 ± 541 for JIA PBMCs; p = 0.0009) (Fig. 1D). This effect was abrogated with addition of the ATPase inhibitor ARL67156. After sorting cells into CD39+ and CD39− populations, exogenous ATP hydrolysis was only observed with populations expressing CD39 (Fig. 1E). CD39+ SFMCs had the greatest ATPase activity on a per-cell basis (557 ± 135 light units compared with 1557 ± 580 for JIA PBMCs; p = 0.0006), reflecting the higher MFI of CD39 expressed on this population. Again, ATPase activity was significantly reduced in the presence of the specific inhibitor (Fig. 1E). We next analyzed ATPase activity of CD39 at the biochemical level using reverse-phase HPLC (Fig. 1F). This assay confirmed that CD39+ sorted cells can generate ADP, AMP, and adenosine, and, again, CD39 activity was inhibited in the presence of ATPase inhibitor ARL67156 (Fig. 1G, 1H). Near identical results were obtained by inhibition with the inhibitor POM-1 (data not shown). Minimal breakdown of ATP was observed by CD39− sorted cells. Data from blood and synovial cells (total mononuclear cells and CD39+ sorted) are summarized in Fig. 1G and 1H. To address whether CD39+ CD4 T cells in the joint were phenotypically similar to classical Tregs, we analyzed coexpression of Treg markers on this population. By flow cytometry, we demonstrated CD4 T cells coexpressing CD39 and Foxp3 as previously described (4). Intriguingly, we also found that there is typically a population of CD4 T cells that are CD39+ but Foxp3−, even in PBMCs, and that this population was clearly increased in the inflamed joint. Fig. 2A shows data from typical healthy PBMCs and JIA PBMCs and SFMCs from the same patient gated on CD4 T cells (Fig. 2A, top panel) and CD8 T cells (Fig. 2A, bottom panel). As expected, <1% of CD8 T cells expressed Foxp3. We have previously published that Tregs are highly enriched in the joint in patients with JIA, and although Foxp3 can be upregulated in activated human cells (29, 30), in JIA, Foxp3+ synovial CD4 T cells are suppressive (31). As expected, the percentage of CD39+Foxp3+ cells in CD4 T cells was significantly greater in JIA SFMCs than PBMCs from either patients with JIA or healthy controls (7.0 ± 7.6% for SFMC versus 1.5 ± 1.0% and 1.8 ± 1.0%, respectively; p < 0.009). These data are depicted in Fig. 2B; individual data points are shown to demonstrate the variability between samples. Intriguingly, the percentage of CD39+Foxp3− CD4 T cells was also much increased in JIA SFMCs compared with PBMCs from patients or controls (17.0 ± 11.1% for SFMC versus 2.4 ± 1.2% and 4.1 ± 1.8%, respectively; p = 0.0002, p = 0.001). Because of the large expansion of this novel population (CD4+CD39+Foxp3−), the proportion of Foxp3+ cells within the overall CD39+ CD4 T cell population was significantly reduced in the inflamed joint compared with healthy control peripheral blood (20.4 ± 10.1% for SFMC versus 33.5 ± 9.2% for PBMCs; data not shown). Analysis of CD25 expression showed that the expression of CD39 was also not confined only to CD25hi CD4 T cells in the cells from the inflamed joint (Fig. 2C). In fact, within the synovial T cells, the proportion of CD39+CD25− cells was greater than CD39+CD25+ cells (20.5 ± 12.5% versus 8.8 ± 6.1%; p = 0.027). CD39+ CD4 T cells have Foxp3+ and Foxp3− subpopulations. A, Foxp3 and CD39 expression in mononuclear cells was analyzed using flow cytometry. Data were gated on CD3+CD4+ cells (top panel) or CD3+CD8+ (bottom panel); dot plots show CD39 expression against Foxp3 expression for CD4 T cells of control PBMCs, JIA PBMCs, and SFMCs. Each are representative of >8 independent experiments with different donors. B, Scatter plot summarizing flow cytometry data shows percentage of CD4 T cells expressing CD39 and/or Foxp3. Mean values indicated by horizontal line are given for control PBMCs, JIA PBMCs, and JIA SFMCs (n = 16, 16, 20), respectively. C, Analysis of CD25 expression on CD39+ T cells. Left panel, Dot plot gated on CD4 T cells from a representative JIA SFMC sample. Right panel, Bar graph summarizing data from control PBMCs, JIA PBMCs, and JIA SFMCs (n = 13, 10, 9, respectively). Bars represent mean + SD. Horizontal bar represents p < 0.05. Previous data have shown that classical Tregs reside within the CD25bright population and typically have a CD127lo, CCR4+ phenotype (32–34). To define the phenotype of the CD39+ Foxp3− cells, we analyzed this population for surface expression of these proteins associated with Tregs and for cytokine production. Fig. 3A shows CCR4 and CD127 expression levels on four cell populations based on expression of CD39 and Foxp3. CD39+Foxp3+, CD39+Foxp3−, CD39−Foxp3+, and CD39−Foxp3− quadrants (Fig. 3A, left panel) were each analyzed for expression of CCR4 and CD127 (Fig. 3A, right panels). CD4 T cells expressing CD39 fell into two populations: cells that also expressed Foxp3+ were CCR4+ CD127lo as expected, whereas CD39+Foxp3− cells expressed lower levels of CCR4 and expressed higher levels of CD127; data summarized in Fig. 3B. Expression of other Treg markers on CD39+ CD4 T cells. A, Mononuclear cells were gated on CD3+CD4+ cells and analyzed for Treg surface markers CCR4 and CD127. Dot plot shown is gated on CD4 T cells from control PBMCs (one experiment representative of four) and the populations generated by Foxp3 and CD39 quadrants (i.e., CD39+Foxp3+, CD39+Foxp3−, CD39−Foxp3+, and CD39−Foxp3−, which are shown in histogram overlays showing expression of CCR4 [middle panel] and CD127 [right panel]). 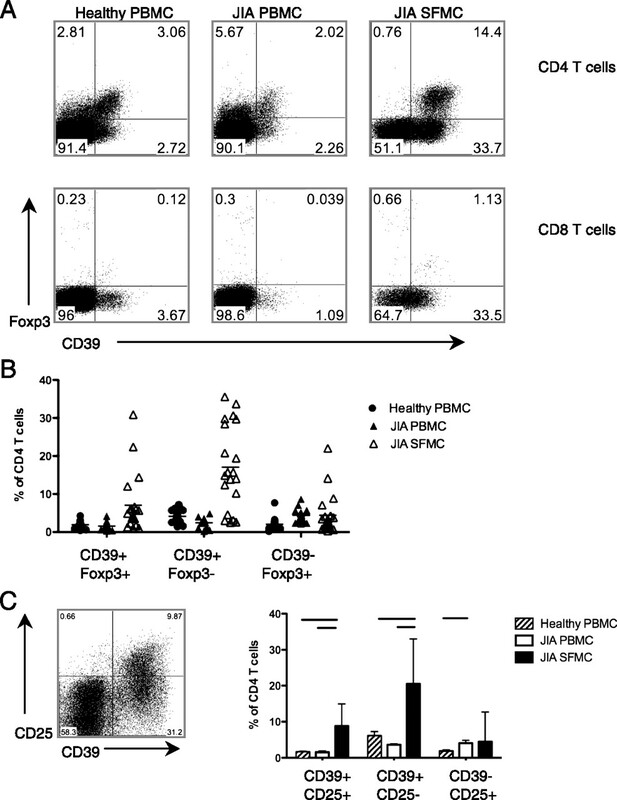 B, Bar graphs show data for percentage of CD4+CD39+Foxp3+ and CD4+CD39+Foxp3− T cells CCR4+ (left panel) and CD127lo (right panel) for healthy control PBMCs, JIA PBMCs, and JIA SFMCs (n = 5, 5, 5 and n = 5, 6, 5), respectively. Bars represent mean + SD. Horizontal lines represent differences between CD39+Foxp3+ and CD39+Foxp3− groups. p < 0.05. Because we have previously shown that cells expressing IFN-γ are enriched in the synovial fluid of children with JIA (35), we next explored the cytokine profile of CD39+ T cells seen at this inflammatory site in conjunction with Foxp3. We observed that CD4 T cell cytokine expression (IL-2, IFN-γ, and IL-17) is largely confined to the Foxp3− population whether cells are CD39+ (Fig. 4A, left panel) or CD39− (Fig. 4A, right panel). CD4 T cells from SFMCs produced higher levels of IL-2 and IFN-γ than those from peripheral blood, and this was also the case within the CD39+ CD4 T cell compartment (Fig. 4A, summarized in Fig. 4B). Within the CD39+ compartment, CD39+Foxp3− cells had high expression of the inflammatory cytokines IL-2 and IFN-γ (Fig. 4B) in marked contrast to the Foxp3+ cells. As expected, we found little IL-2 production by CD39+Foxp3+ CD4 T cells compared with the Foxp3− population whether from the peripheral blood or the inflamed site. 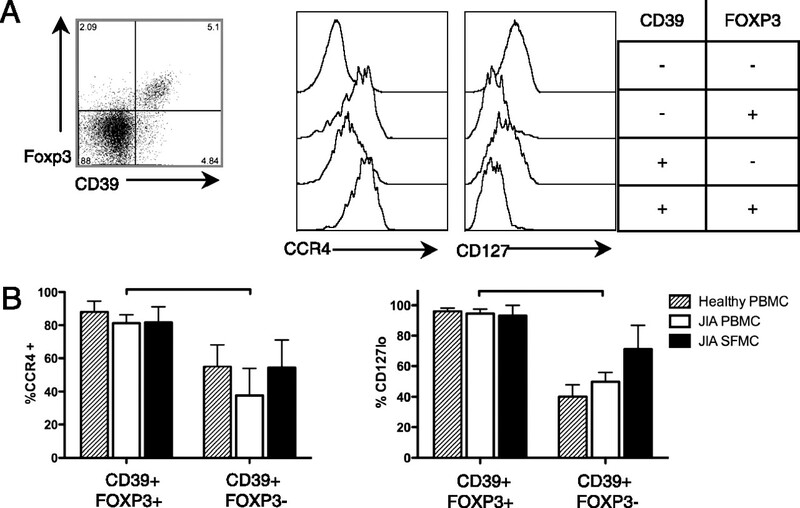 The cells expressing CD39 that are Foxp3− expressed far higher levels of IFN-γ than classical CD39+Foxp3+ cells whether they were from the blood or the inflamed site (Fig. 4B). We and others have observed that Tregs may make small amounts of inflammatory cytokines (36); there was a modest increase in IFN-γ in the CD39+Foxp3+ synovial fluid population indicative of active inflammation in SFMCs. We have previously seen that Th17 cells are highly enriched in the joint and that their numbers correlate with clinical disease activity (18). Interestingly, we also noted that some CD39+ CD4+ T cells make IL-17 (Fig. 4A), and, again, the majority of these proinflammatory CD39+ T cells were within the Foxp3-negative population (Fig. 4B) whether from peripheral blood or synovial fluid. As we have previously shown, there are proportionately more CD4 T cells expressing IL-17 in the inflamed site (18). As expected, CD39+ cells were largely confined to the CD45RO+ compartment, and, as we and others have previously shown, >95% of cells from the inflamed joint are CD45RO+ (Supplemental Fig. 1A). Expression of the cytokines IL-2, IFN-γ, and IL-17 were also mainly within the CD45RO+ compartment, as predicted (Supplemental Fig. 1B). Together, our results suggest that the novel population that we have identified, CD39+Foxp3−, is enriched in the synovial fluid and has a memory phenotype. CD39+ CD4 T cells may express proinflammatory cytokines. After short in vitro stimulation with PMA (50 ng/ml) and ionomycin (500 ng/ml), intracellular cytokine staining was performed for IL-2, IFN-γ, and IL-17 and cells costained for CD39 and Foxp3. Data were gated on CD4+ T cells and are representative of n = 5, 8, 6 (control PBMCs, JIA PBMCs, and JIA SFMCs, respectively) for each sample type. A, Dot plots showing cytokine production by CD39+ T cells (left panel) and CD39− T cells (right panel) for healthy PBMCs and PBMCs and SFMCs from the same patient with JIA. B, Bar graphs summarizing cytokine expression in CD39+Foxp3− and CD39+Foxp3+ cells. Data are percentage of respective cell population expressing IL-2 (top panel), IFN-γ (middle panel), or IL-17 (bottom panel) as labeled and expressed as mean + SEM. Horizontal lines represent differences between CD39+Foxp3− and CD39+Foxp3+ groups. p < 0.05. Because classical Tregs are anergic in response to stimulation, we next assessed the proliferative and functional capacities of CD4 T cells highly enriched for CD39+Foxp3+, CD39+Foxp3−, and CD39−Foxp3− populations. No unique surface marker is known to exist for human Tregs, so we used FACS sorting based on expression of CD25, CD127 to enrich for Foxp3+, or Foxp3− CD4 T cells. CD4+CD25hiCD127lo cells contain the majority of Foxp3+ cells (34). We sorted three populations from either PBMCs or SFMCs as follows: CD4+CD25hiCD127loCD39+, which was highly enriched for Foxp3+ expression (i.e., CD39+Foxp3+, enriched for Tregs), CD4+CD25loCD127hiCD39+ (i.e., CD39+Foxp3−), and CD39− (i.e., CD39−Foxp3−, referred to in this study as Tresp). The expression of Ki67 indicates progression through the cell cycle (37), and this was observed in <9% of the CD39+Foxp3+ population on average compared with 41% in the CD39+Foxp3− population after anti-CD3 and anti-CD28 stimulation for 7 d (Fig. 5A, summarized in Fig. 5B). These results show that CD39+Foxp3− CD4 T cells are responsive to in vitro stimulation, in contrast to CD39+Foxp3+ cells (which were anergic in vitro as expected). One caveat to these results is that the apparent intermediate level of proliferation seen in the CD39+Foxp3− cells (Fig. 5A, 5B) could be due to contamination by a small number of Foxp3+ cells during the sorting procedure, although this level of contamination was routinely <15%. 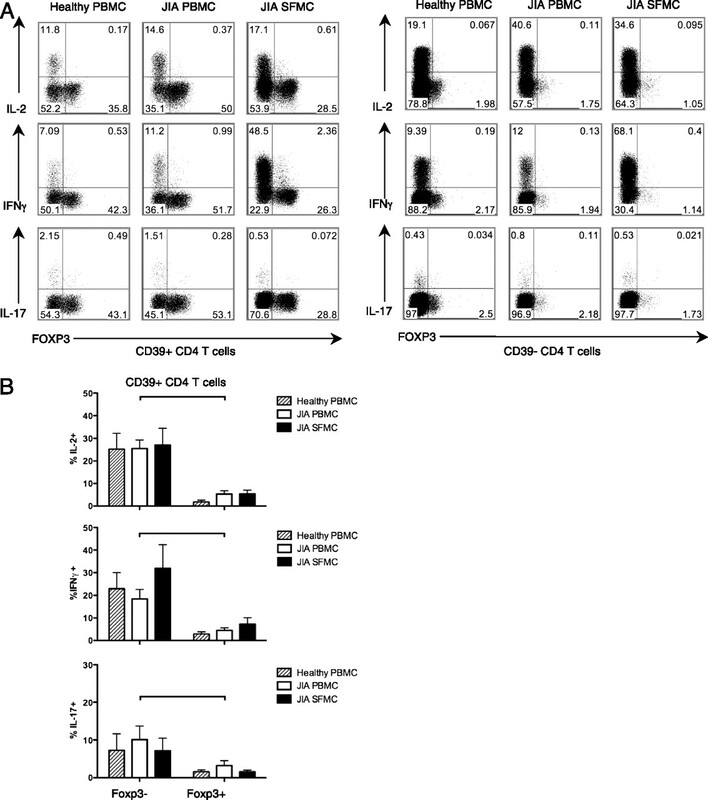 CD39+Foxp3− CD4 T cells do not suppress T cell proliferation. Mononuclear cell populations, healthy PBMCs or JIA SFMCs, were sorted to enrich for three CD4+ T cell populations, CD39+Foxp3+, CD39+Foxp3−, and CD39−Foxp3−, using surface markers CD4+CD25hiCD127loCD39+, CD4+CD25loCD127hiCD39+, and CD4+CD25loCD127hiCD39−, respectively. A, Healthy PBMCs were sorted to enrich for CD39+Foxp3+ Treg, CD39+Foxp3− Tmem, CD39−Foxp3− Tresp CD4 T cell populations and stimulated in vitro with anti-CD3 and anti-CD28 for 7 d. Cell cycle progression was measured by flow cytometry for Ki67 as shown in histogram overlay (enriched for CD39+Foxp3+ Treg, front unshaded; CD39+Foxp3− Tmem; middle gray histogram; CD39−Foxp3− Tresp, rear unshaded). B, Bar graph summarizing Ki67 data from five independent donors (n = 5). Bars represent mean + SD. C, E-ATP breakdown products were measured by HPLC. Total of 5 × 104 cells were incubated in 25 μM E-ATP for 40 min at 37°C in the presence or absence of 100 μM ARL67156 (ARL). Representative HPLC graphs showing E-ATP breakdown by JIA SFMC sorted into populations enriched for CD39+Foxp3+ Treg (left panels), CD39+Foxp3− Tmem (middle panels), and CD39−Foxp3− Tresp (right panels) without (top panels) or with ARL (bottom panels). Data show one experiment representative of three independent experiments. D, ATPase activity was assessed for each of the sorted populations by addition of exogenous ATP and luminometry. ATP remaining at the end of the incubation measured in light units. ATPase activity reduces ATP. For both healthy PBMCs and JIA SFMCs, n = 6, 6, respectively. Bars represent mean + SD. E, CD39+Foxp3+ Treg-enriched or CD39+Foxp3− Tmem-enriched cells were added in a 1:1 ratio with Tresps in standard proliferation assay. Proliferation was assessed using [3H]thymidine incorporation, and the CD39−Foxp3− Tresp population was assigned as 100% proliferation. Proliferation was expressed as a percentage of Tresp proliferation. For both healthy PBMCs and JIA SMFCs, n = 4, 4, respectively. Bars represent mean + SEM. Horizontal lines represent group differences in proliferation compared with Tresps: CD39+Foxp3+; p < 0.05. Since we established that within the CD39+ CD4 T cell population the novel population (CD39+Foxp3−) expresses higher cytokine levels than Foxp3+ cells (which was the case for T cells from both the peripheral blood and the joint), we next assessed the suppressive ability of these two subpopulations (i.e., CD39+Foxp3+ and CD39+Foxp3− CD4 T cells). Cells were enriched for CD39+Foxp3+, CD39+Foxp3−, and CD39−Foxp3− populations, and ATPase activity was assayed by measuring reduction of exogenously added ATP using two assays as above. In both PBMCs and JIA SFMCs, the population enriched for CD39−Foxp3− (Tresp) showed little or no ATPase activity as expected (Fig. 5C, 5D), whereas both CD39+ CD4 T cell populations, irrespective of Foxp3 expression, had rapid ATPase activity. As before, SFMC-sorted CD39+ cells had greater ATPase activity than the same population in PBMCs, reflecting the higher CD39 protein expression on SFMCs compared with PBMCs (Fig. 5D). Interestingly, there was no significant difference in ATPase activity between CD39+Foxp3+ and CD39+Foxp3− CD4 T cells enriched from SFMCs or from PBMCs (p > 0.2 for both SFMCs and PBMCs). Thus, Foxp3 expression did not appear to influence functional ATPase activity in these cell populations. We next asked if there was any difference between CD4 T cells that were CD39+Foxp3+ compared with those that were CD39+Foxp3− in their functional ability to inhibit cell proliferation. We used in vitro suppression of proliferation assay measuring [3H]thymidine incorporation in stimulated cells. Cell proliferation was expressed as a percentage of proliferation compared with the proliferation of stimulated CD4+CD25loCD127hiCD39− cells (Tresp) alone. Upon addition of CD4+CD39+Foxp3+ cells, proliferation was strongly inhibited (Fig. 5D) in both PBMCs and SFMCs, confirming the suppressive capacity of the CD39+Foxp3+ cells. In marked contrast, CD4+CD39+Foxp3− CD4 T cells had no significant effect on proliferation of Tresp (Fig. 5C). Thus, for control PBMCs, proliferation in the coculture of Tresp with CD4+CD39+Foxp3− cells was 87 ± 25% and for SFMC proliferation was 91 ± 16%. This demonstrated a key functional difference between CD4+CD39+Foxp3− and CD4+CD39+Foxp3+ cells independent of whether they were from the inflamed site or peripheral blood. Taken together, these data suggest that expression of CD39 on CD4 T cells confers ATPase activity irrespective of Foxp3 expression and that this effect is enhanced in cells from the JIA SFMCs. However, suppression of proliferation of Tresps was confined to the CD4+CD39+Foxp3+ population, and CD4+CD39+Foxp3− cells were not suppressive. Several recent studies have suggested that CD39+ Tregs can generate adenosine through the combined actions of CD39 and a second ectonucleotidase, CD73 (a specific AMPase) (19, 24, 38). Our results confirmed the generation of adenosine (Fig. 1F) by CD39+ cells from peripheral blood, but unexpectedly suggested AMPase activity in SFMCs to be lower. We therefore further investigated specific AMPase activity of mononuclear cells from the blood and inflamed joint by HPLC analysis. PBMCs from both controls and children with arthritis showed potent AMPase activity, which was inhibited by the specific inhibitor of CD73, APCP (Fig. 2A, 2B, Supplemental Material). Interestingly, synovial fluid cells had very low AMPase activity (Fig. 2B, Supplemental Material). Sorting of cells from both blood and synovial fluid by expression of CD39 revealed AMPase activity in both the CD39− and CD39+ fractions, but, again, SFMCs lacked AMPase activity (Fig. 2C, Supplemental Material). Flow cytometric analysis of CD73 expression confirmed low levels of CD73 expression on synovial cells, whether on B cells, CD4+ T cells, or mononuclear cells as a whole (Fig. 2D–2G, Supplemental Material). Analysis for expression of both CD39 and CD73 confirmed that low numbers of CD4+CD39+ cells coexpress CD73 at the cell surface (Fig. 2E, Supplemental Material). CD4+ cells from both PBMCs and SFMCs were sorted into conventional Tregs (CD39+Foxp3+) and our novel memory population (CD39+Foxp3−) and tested for AMPase activity in this assay. Interestingly, neither of these T cell populations showed high activity for breakdown of AMP in this assay compared with the control population (Fig. 2H, Supplemental Material). This study describes a novel cell population within the human CD39+ CD4 T cell compartment. We characterize CD4 T cells expressing the ectonucleotidase CD39 but which do not express Foxp3 in the context of health and childhood arthritis. To our knowledge, there has been no previous study of CD39 function in human arthritis. Our data show that the expression of CD39 surface protein is significantly increased on inflammatory synovial T cells both in terms of number of cells that express CD39 and also the mean protein level per cell. Concordant with this observation, we show that T cells from the inflamed joint rapidly hydrolyze ATP and that this ATPase activity is confined to the CD39+ population. Our data are consistent with the reports that more CD39 is expressed on CD45RO+ memory/activated CD4 T cells than naive cells in health and adult rheumatoid arthritis (4, 39, 40) and after in vitro stimulation (40); the latter we confirmed and also observed on sorted CD39− CD4 T cells (data not shown). We propose that increased expression of CD39 on T cells from the inflamed site could represent an immunomodulatory mechanism via hydrolysis of ATP (4, 7, 27, 41). However, our results also show that within the synovial inflamed compartment, surface expression of the AMPase CD73 and AMPase functional activity are both reduced compared with blood. This is intriguing because it is thought that generation of adenosine is required for the potent anti-inflammatory effect this pathway may provide; our results therefore suggest that the breakdown from ATP to adenosine may be incomplete at the chronic inflammatory site. CD39 is also known to be expressed on B cells and monocytes on healthy peripheral cells (40) and B cell clones from rheumatoid arthritis joint cells (42), and we have extended these observations: >90% of the B cells and monocytes expressed CD39 and did not differ among healthy controls, JIA PBMCs, or the joint (data not shown). Recent studies showing classical Foxp3+ Tregs express CD39 and that CD39 may be a good marker of Tregs (3, 4, 7) led us to investigate the role of CD39 in immunoregulation in JIA. We and others have previously shown that Tregs, identified initially by high expression of CD25 and subsequently by Foxp3 expression, are highly enriched in the inflamed joints of patients with JIA and, importantly, that their numbers correlate with clinical outcome (18, 31, 43). To elucidate the function of CD39 on CD4+ T cells in JIA, we first characterized the expression of CD39 and Foxp3 protein in health and arthritis. We demonstrate that CD39+ CD4 T cells can be divided into functionally distinct Foxp3+ and Foxp3− populations. Recent reports suggest that the expression of CD39 is correlated with Foxp3 (4, 7), and our results also show high expression of CD39 on those cells expressing markers of classical human Tregs (i.e., CD25hi), chemokine receptor CCR4hi and CD127lo (31, 34). However, in addition, we observe a population of CD39+ CD4 T cells not expressing markers of classical Tregs. Our data reveal a novel population CD4+CD39+Foxp3− that are CCR4int and do not express the IL-7R chain, CD127 (34); this is in contrast to classical human Tregs. Functionally, we show that the CD39+Foxp3− cells are distinct from classical Tregs. Both populations of CD39+ T cells, whether they coexpress Foxp3 or not, have the ability to break down ATP, as we have shown using two assays, and this activity parallels their surface expression level of CD39 protein (4). Synovial CD39+ cells have higher ATPase activity on a per-cell basis than the equivalent cells from blood, reflecting their high surface expression of CD39. However, CD39+ cells that do not express Foxp3 do not function as suppressors in a standard in vitro suppression assay of proliferation and are responsive to a TCR proliferative signal in vitro. In addition, this novel population (CD39+Foxp3−) makes greater amounts of IL-2, IFN-γ, and IL-17 than their Foxp3+ counterparts, again suggesting that this novel population does not have a classical Treg phenotype, but rather a Tmem phenotype. Given the enrichment of Tregs in many inflammatory infiltrates in a variety of conditions (31, 44), it was not unexpected that we would find an enrichment of cells expressing both CD39 and Foxp3 in the inflamed joint in JIA. However, it is clear from our study that the increase in CD39+ cells in arthritis is not only due to the enrichment of Tregs. Our data suggest that CD39 expression may be modulated by the inflammatory milieu as previously suggested in other conditions including rheumatoid arthritis and pancreatitis (39, 45). We propose that the inflammatory milieu may lead to T cell upregulation of CD39 as one mechanism to dampen inflammatory effects and restore balance. If so, this is another example of a homeostatic mechanism that dampens inflammation as it progresses, such as the upregulation of CD152 (CTLA-4) after T cell activation (46) and induction of Ag-specific Tregs during responses to infection (47). The mechanisms through which Tregs suppress a wide variety of inflammatory cells remain unclear but are likely to be multiple and to include CD39 function (48). However, our data suggest that CD39 expression alone on human CD4 T cells is not sufficient for classical Treg activity because CD39+Foxp3− cells do not suppress proliferation, and they do make inflammatory cytokines. Extracellular ATP has multiple inflammatory effects including dendritic cell activation, leukocyte migration, and proinflammatory cytokine production (41, 49). Treg hydrolysis of ATP through CD39 is anti-inflammatory and in mice is a rate-limiting step for the anti-inflammatory downstream product adenosine (3). Consistent with this are reports showing ATP triggers and maintains inflammation in asthma (41) and drives generation of inflammatory Th17 cells in the lamina propria (15) and that a reduction in peripheral blood CD39+ CD4 T cell numbers may be a contributing factor to autoimmune disease as observed in patients with multiple sclerosis compared with healthy controls (4). Our study demonstrates increased frequencies of CD39+Foxp3− T cells at the inflammatory site. We hypothesize that by contributing to ATP hydrolysis, these cells have an anti-inflammatory role (4), but that in the absence of adequate AMPase activity, the breakdown of ATP at this inflamed site may be incomplete or inadequate and that this is insufficient to completely control joint inflammation. Further studies are required to explain the mechanisms that generate increased numbers of CD39+ T cells in the inflamed site and their impact upon inflammation because in human cells, the effects of extracellular ATP are complex depending in part upon the variable expression of receptors for ATP (50). In summary, we have demonstrated a high expression of the ectonucleosidase CD39 on T cells from the joint in juvenile arthritis. We find that CD39 is functional in that these cells can deplete the extracellular milieu of ATP and that this ATPase activity correlates well with surface levels of CD39 expression. In contrast, we show a specific lack of AMPase activity (and low CD73 expression) in synovial fluid cells from the same patients. We show that although a subset of CD39+CD4+ T cells coexpresses the Treg-specific transcription factor Foxp3 and other markers of Treg, a second population of CD39+CD4+ T cells also exists, which is Foxp3−. This population is a relatively small proportion of T cells in the peripheral blood of either patients or controls (typically <6% of CD4 T cells) but is much enriched in the inflamed joint. These CD39+Foxp3− cells still break down ATP efficiently yet do not suppress the proliferation of effector T cells and do make high levels of proinflammatory cytokines. The identification and characterization of Foxp3+ and Foxp3− cells within the CD39+ CD4 T cell population will be an important step in understanding the complex effects of extracellular ATP in human inflammation. We thank patients, families, and volunteers for contribution of samples, as well as hospital staff who made this study possible. We also thank Simona Ursu, Jo Sinclair, and Prabhjoat Chana for excellent technical assistance and the unit members for processing patient samples. This work was supported by Sparks UK and the Big Lottery Fund (Grant 05BLF/ICH02). K.N. was supported by an Arthritis Research Campaign Clinical Fellowship (17998). Some of the equipment was supported by Arthritis Research Campaign Grant 17746.
. 2010. Regulatory T cells exert checks and balances on self tolerance and autoimmunity. Nat. Immunol. 11: 7–13.
. 2007. Expression of ectonucleotidase CD39 by Foxp3+ Treg cells: hydrolysis of extracellular ATP and immune suppression. Blood 110: 1225–1232.
. 2009. Increased ectonucleotidase expression and activity in regulatory T cells of patients with head and neck cancer. Clin. Cancer Res. 15: 6348–6357.
. 1996. Identification and characterization of CD39/vascular ATP diphosphohydrolase. J. Biol. Chem. 271: 33116–33122.
. 2007. CD39 and control of cellular immune responses. Purinergic Signal. 3: 171–180.
. 2006. The P2X7 receptor: a key player in IL-1 processing and release. J. Immunol. 176: 3877–3883.
. 2007. Stimulation of P2 receptors causes release of IL-1beta-loaded microvesicles from human dendritic cells. Blood 109: 3856–3864.
. 2005. Role of interleukin-1 (IL-1) in the pathogenesis of systemic onset juvenile idiopathic arthritis and clinical response to IL-1 blockade. J. Exp. Med. 201: 1479–1486.
. 2007. Blood and synovial fluid cytokine signatures in patients with juvenile idiopathic arthritis: a cross-sectional study. Ann. Rheum. Dis. 66: 589–598.
. 2007. Pattern of interleukin-1beta secretion in response to lipopolysaccharide and ATP before and after interleukin-1 blockade in patients with CIAS1 mutations. Arthritis Rheum. 56: 3138–3148.
. 2008. Serum IL-18 levels in patients with type 1 diabetes: relations to metabolic control and microvascular complications. Cytokine 42: 217–221.
. 2007. Increased IL-18 serum levels in patients with juvenile systemic lupus erythematosus. Acta Reumatol. Port. 32: 397–398.
. 2008. ATP drives lamina propria T(H)17 cell differentiation. Nature 455: 808–812.
. 2007. Interleukin-22, a T(H)17 cytokine, mediates IL-23-induced dermal inflammation and acanthosis. Nature 445: 648–651.
. 2008. Increased numbers of circulating polyfunctional Th17 memory cells in patients with seronegative spondylarthritides. Arthritis Rheum. 58: 2307–2317.
. 2008. Interleukin-17-producing T cells are enriched in the joints of children with arthritis, but have a reciprocal relationship to regulatory T cell numbers. Arthritis Rheum. 58: 875–887.
. 2009. CD39+Foxp3+ regulatory T Cells suppress pathogenic Th17 cells and are impaired in multiple sclerosis. J. Immunol. 183: 7602–7610.
. 2004. P2X7 receptor polymorphism impairs extracellular adenosine 5′-triphosphate-induced interleukin-18 release from human monocytes. Genes Immun. 5: 588–591.
. 2000. 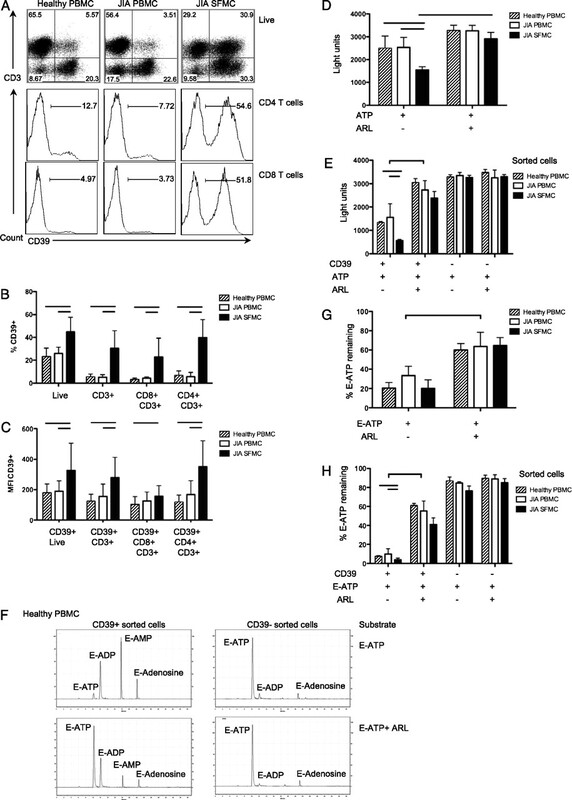 CD39 modulates IL-1 release from activated endothelial cells. Biochem. Biophys. Res. Commun. 270: 272–278.
. 2006. Suppression of inflammation by low-dose methotrexate is mediated by adenosine A2A receptor but not A3 receptor activation in thioglycollate-induced peritonitis. Arthritis Res. Ther. 8: R53.
. 2010. Generation and accumulation of immunosuppressive adenosine by human CD4+CD25highFOXP3+ regulatory T cells. J. Biol. Chem. 285: 7176–7186.
. 2009. Isolated CD39 expression on CD4+ T cells denotes both regulatory and memory populations. Am. J. Transplant. 9: 2303–2311.
. 2006. ATP release from activated neutrophils occurs via connexin 43 and modulates adenosine-dependent endothelial cell function. Circ. Res. 99: 1100–1108.
. 2008. ATP is released by monocytes stimulated with pathogen-sensing receptor ligands and induces IL-1beta and IL-18 secretion in an autocrine way. Proc. Natl. Acad. Sci. USA 105: 8067–8072.
. 2007. Transient regulatory T-cells: a state attained by all activated human T-cells. Clin. Immunol. 123: 18–29.
. 2004. CD4+CD25bright regulatory T cells actively regulate inflammation in the joints of patients with the remitting form of juvenile idiopathic arthritis. J. Immunol. 172: 6435–6443.
. 2000. Selective recruitment of polarized T cells expressing CCR5 and CXCR3 to the inflamed joints of children with juvenile idiopathic arthritis. Arthritis Rheum. 43: 765–774.
. 2006. Regulation of trafficking receptor expression in human forkhead box P3+ regulatory T cells. J. Immunol. 177: 840–851.
. 2006. Antigen-specific central memory CD4+ T lymphocytes produce multiple cytokines and proliferate in vivo in humans. J. Immunol. 177: 8185–8190.
. 2009. CD73 is expressed by human regulatory T helper cells and suppresses proinflammatory cytokine production and Helicobacter felis-induced gastritis in mice. J. Infect. Dis. 199: 494–504.
. 2000. Increased expression of CD40 ligand (CD154) on CD4+ T cells as a marker of disease activity in rheumatoid arthritis. Ann. Rheum. Dis. 59: 190–195.
. 2007. CD39/NTPDase-1 activity and expression in normal leukocytes. Thromb. Res. 121: 309–317.
. 2006. Limited VH gene usage in B-cell clones established with nurse-like cells from patients with rheumatoid arthritis. Rheumatology (Oxford) 45: 549–557.
. 2005. Coexpression of CD25 and CD27 identifies FoxP3+ regulatory T cells in inflamed synovia. J. Exp. Med. 201: 1793–1803.
. 2004. CD25brightCD4+ regulatory T cells are enriched in inflamed joints of patients with chronic rheumatic disease. Arthritis Res. Ther. 6: R335–R346.
. 2007. Upregulation of CD39/NTPDases and P2 receptors in human pancreatic disease. Am. J. Physiol. Gastrointest. Liver Physiol. 292: G223–G230.
. 2002. Cyclic adenosine 5′-monophosphate and calcium induce CD152 (CTLA-4) up-regulation in resting CD4+ T lymphocytes. J. Immunol. 169: 6231–6235.
. 2004. Antigen-specific regulatory T cells—their induction and role in infection. Semin. Immunol. 16: 107–117.
. 2005. Cell-surface enzymes in control of leukocyte trafficking. Nat. Rev. Immunol. 5: 760–771.
. 2008. Hydrolysis of extracellular ATP and immune suppression: humans versus mice. Blood 111: 964–965, author reply 965–966.